2 x Waterproof Panels: 9.8 x 18"
1 x Softbox: 34 x 34"
The FL1600VK Bi-Color LED 2-Panel Package from Cineroid offers image makers the opportunity to transform these versatile, flexible light sources into rigid LED panels. 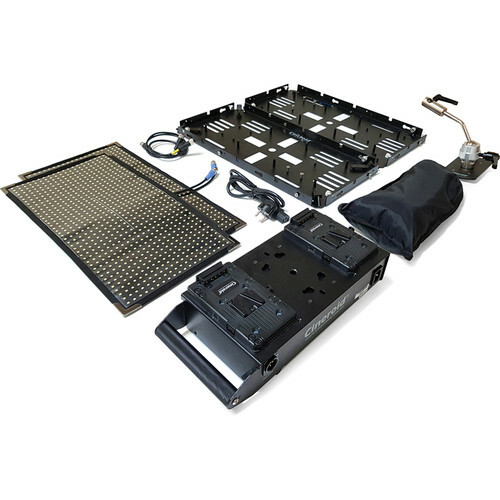 The package includes two 9.8 x 18" FL800 waterproof LED panels, each with a rigid panel support, a 2700 to 6500K controller, V-mount for batteries, controller mount, a ball head with 5/8" spigot, and a softbox. The 9.8 x 18" light source employs 800 LEDs to output 3400 lux while maintaining a high CRI of 94 indicating an accurate rendition of color. The lightweight (10.6 oz) FL800 is waterproof (except for the Controller) and is impervious to rain, snow, or humid conditions. In fact, you can wash it with water. The separate FL Controller is the "brain" or the adjustment component of the system. Color temperature is adjusted with a simple dial from a warm 2700K to an icy blue 6500K to match other fixtures, deal with almost any ambient light situation, or just to provide creative freedom. Light intensity is adjustable too, from 0-100% without flicker, saving you from pulling the light back and forth to achieve the right level of illumination. Both color and dimming can be controlled locally on the unit or remotely from a console with the purchase of a DMX encoder. Settings appear on the Controller's LCD screen. The panel can be bent into any shape that suits your subject and lighting requirements. The panel (but not the Controller) is waterproof and impervious to rain or humidity. In fact, the panel's surface can be washed with water. The separate Controller allows adjustment of color from 2700-6500K and light intensity from 0-100%. The AC/DC unit accepts an optional DMX encoder for remote adjustments. It can also run on external batteries when AC power is unavailable. The FL800 outputs a flicker-free 3400 lux while maintaining a high CRI of 94, indicating an accurate rendition of color.